GIF, or Graphics Interchange Format, is a lossless format of image files that supports both animated and static images. Animated GIFs have become widely popular all over social media to make conversation dramatic or funny. If you want to provide more visual information but unable to put up heavy and length videos in your projects, then GIFs are the best solution. Now the question is: how to convert video to animated GIF? Don’t worry. In this post, we have rounded up the best free video to GIF converters for Windows PC, Mac, Android and iOS devices to help you make GIFs from videos with ease. 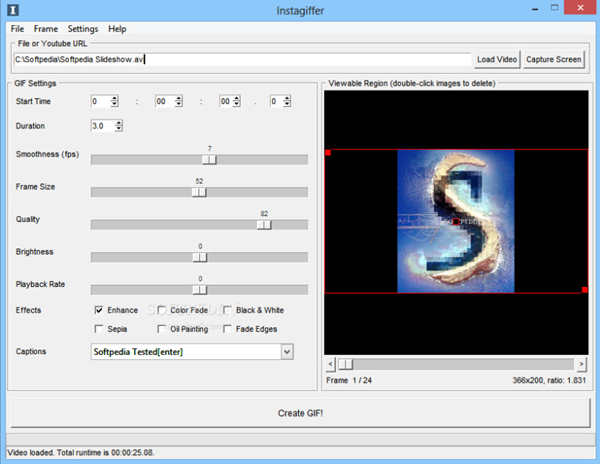 Instagiffer is one of the best free video to GIF converters that allows you to create the best animated GIFs from videos. This program has a very simple interface without any confusing menus. You can easily process all popular video formats like MP4, MKV, AVI, and WMV etc. to create great GIFs. Totally free and easy to use, and free from annoying ads and spyware. Add customizable text, logos, filters, loops, and more to GIFs. Create optimized, quality GIFs under 1MB in size, or large 60fbs HD GIFs. Make 3D GIFs, slow motion GIFs, or beautiful cinemagraphs and subtle movement GIFs. Convert GIFs ti Instagram or Vine videos with sound and save them in .webm or .mp4. Any GIF Animator is a free, easy yet powerful GIF maker tool to create animated GIF simply and easily. It lets you make GIFs from multiple video formats like MP4, MOV, AVI, WMV, MPG, 3GP, and much more. In addition, you can import videos from DVDs and record from webcams to crate GIFs. Comes with intuitive interface, simple and completely free to use. Convert any type of video into animated GIFs within seconds. Allows you to specify frame rate start and end time markers with ease. You can customize and add texts, effects, captions, filters to make your GIFs more attractive. VideoSolo Free Video to GIF Converter is the most wonderful GIF Maker, which allows you to convert any video files to animated GIF image freely. 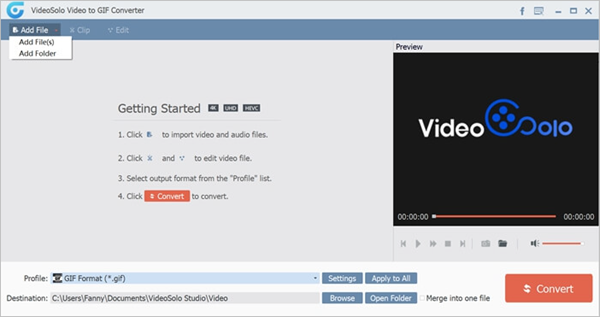 This program features a simple and user-friendly interface, makes it easier for you to create your own GIFs from any video in different format. The program has very simple user interface without any complications. 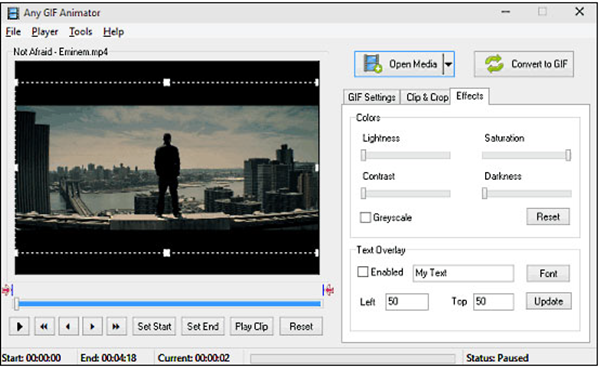 Allows your to trim the video or merge different segments of the same video into one GIF. Built-in editor lets you crop video, adjust the color brightness, contrasts, saturation and hue to make amazing GIFs. You can add text or picture on your GIFs and control the frame rate of GIF. 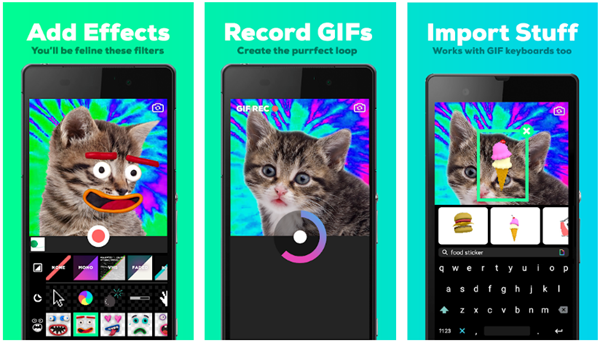 If you want to create cool GIFs on your Android device, then you’re going to check out GIPHY CAM. 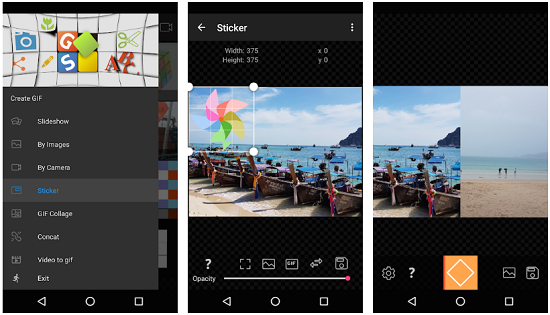 It is truly one of the most creative and customizable GIF Maker apps out there, allowing you to record videos right through the app to create GIFs or import existing videos from your camera roll. Add filters from VHS to 3Dee and special FX to enhance your GIFs. Easily share your GIFs on text, Instagram, Twitter, Facebook Messenger or post it on the web. Direct create or record GIF from the apps. 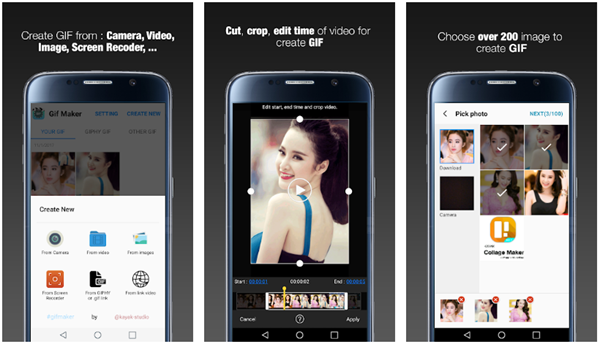 GIF Maker is one of the most rated and trusted GIF editors by its users across the world on Android platforms. It provides an easy way to create GIF from your video or multi images. You can easily edit, cut and crop video before creating animated GIF. Add label with text style, color, stickers in your GIF. Easily manage all GIF file you have created and view them whenever you want. Allows you to create GIF from GIF link like GIPHY or video in social network. One click to share and upload your GIF to Facebook, Twitter, Giphy, Imgur, etc. GIF Studio is another creative and versatile GIF apps that lets you view, create and edit animated GIFs. It has simple user interface, and allows you to make GIFs using the camera or existing photos just like many other GIF apps. Also, it is a great GIF Player, which plays animation and change its speed with sliding gestures. Add styled text to any GIF and control its timing, size, style, color and position. You can crop GIF to reduce size, add sticker, change the background of GIF to transparent, concat two animated GIFs, etc. Add an animated GIF to a static photo or add a static photo to an animated GIF. Allows you to extract images from GIFs and save them on your device. You can easily share animated GIFs to Google Plus, Twitter, WeChat, etc. Looking for a super simple GIF editor app for iOS? 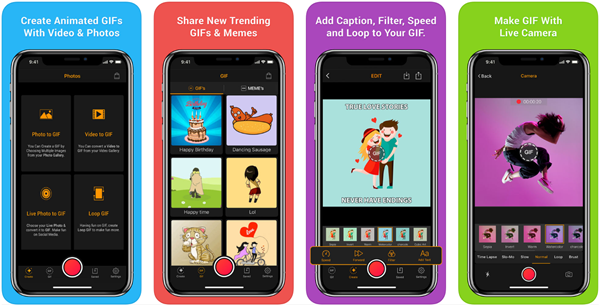 GIF Maker is the best GIF creator & editor at App Store, which allows you to create funny GIFs from existing videos or photos in your iPhone or iPad. Also, it has a huge collection of trending GIFs and Memes for you. Allows you to create boomerang videos for Instagram. Turn your photos to funny Memes, and create GIF from Live Camera. Add text and beautiful filters on your own GIFs. Lets you adjust the frame speed of GIFs. 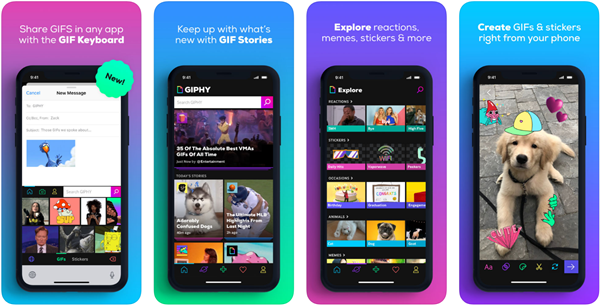 GIPHY for iOS has the world’s largest library of animated GIFs, which makes it easy and fast to search and share GIFs across all popular social medias such as Facebook Messenger, iMessage. Also, it allows you to create your own custom GIFs with the built in GIPHY Cam features or the new Sticker Maker. Allows you to send GIFs in any app that accepts media like text, email, messengers, social apps, and more. Upload existing videos directly from your iPhone’s Camera Roll to create animated GIFs. Add captions, stickers, filters and other accessories to your own custom GIF content. With 4.7 ratings on the App Store, ImgPlay is a good and most trusted GIF maker to convert video to GIF on iOS devices. Using it, you can make your own GIFs from Live Photos, Burst photos, and photos saved in the library. Very simple and easy to use, no complicated. Add captions and apply various filters. Edit frame sector and frame order, and control frame playing speed and direction. Share created GIFs to Facebook, Twitter, Instagram, WhatsApp, Wechat, etc. These are some of the best free Video to GIF converters for Windows PC, Android and iPhone. Just choose the suitable GIF Maker for your needs to make funny and dramatic GIFs. If you know any other great free Video to GIF converter, tell us in the comment section below. If you find this article helpful, please share it to Facebook and Twitter to help your friends and family make GIFs with ease. What is “Other Storage” on Mac and How to Delete it?